I am familiar with Anna Taborska’s filmmaking career as producer and director, and her films are moving and artistically superb. FOR THOSE WHO DREAM MONSTERS is my first experience with Taborska’s collection of fiction, and like her films, this creation is artistically superb. But what really grabs the reader is how this book delves into darkness, and I mean real darkness. 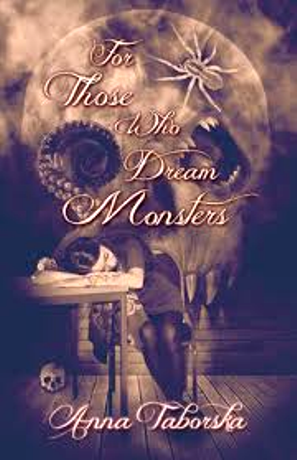 FOR THOSE WHO DREAM MONSTERS is visceral in its storytelling, really punching the reader in the gut. Taborska does not tread lightly into her subjects; she reveals things in all their gruesome realities. A huge plus is that each story is begun with pen-and-ink illustrations by Reggie Oliver. These disturbing works appear almost in a medieval style; highly detailed and filled with menacing beasties and ghoulies. They are brilliant openings into the twisted world of Taborska’s fiction. Since this is a fiction collection, I will not comment on all the stories, but will pick and choose from my favorites. The first story is titled “Schrödinger’s Human,” and is of course about a cat. Schrödinger’s cat is a thought experiment, sometimes described as a paradox, devised by Austrian physicist Erwin Schrödinger in 1935. It illustrates what he saw as the problem of the Copenhagen interpretation of quantum mechanics applied to everyday objects. The scenario presents a cat that may be both alive and dead, depending on an earlier random event. And in “Schrödinger’s Human,” the cat does not disappoint. “Fish” is about bad guys that choose the wrong house in what should have been a fatal mistake. But Harry Tomlinson doesn’t die. Instead he experiences “a row of venomous barbs” that emits from a frightened Scorpion Fish. What happens next is startling, and this story ends with a nice twist. The story “Cut!” demonstrates Taborska’s filmmaking experience because it is about a director. Because of her own role as director, “Cut!” makes for a very authentic tale. “Arthur’s Cellar” is a thrilling tale that begins with action and suspense. “Arthur raced through the darkening forest, ignoring the branches that scratched him” is the opening line, and it gets even better from there. What dwells in the cellar? This story works on every level and is my favorite in the book. I was more than pleased to find “Halloween Lights” in this book, because that story was published in a very early issue of The Horror Zine. Obviously this is another one of my favorites. This is a suspenseful tale where a young man has temporary amnesia, and he tries to find help on Halloween night by finding a porch light. His experiences as he travels past the trick o’ treaters on the street that gawk at him are fascinating. Finally we have “Underbelly,” in which the character bears the name Anna, same as the author. Hopefully this is no autobiography! The character Anna is facing death from cancer, until a frightening creature steps in to help…for a price. This is one of the better fiction collections that I have read. Just because I have not reviewed every story does not mean they are not all good, they are. Each story is unique and Taborska does not skimp on the frights. 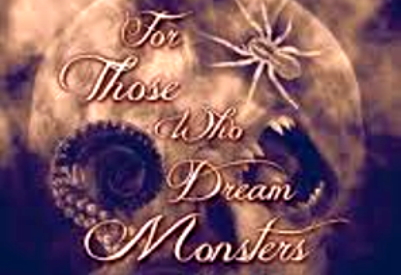 Best of all, FOR THOSE WHO DREAM MONSTERS oozes with talent. This is an unusual book, almost like gothic merged with modern prose. If you are seeking fiction that is truly scary, buy this book. It will scare you. Anna Taborska was born in London, England. She was first caught reading horror at age ten, when a teacher, impressed that Anna was sitting at her desk during lunch break and reading rather than playing with other children in the school playground, found that Anna’s science book was actually hiding Guy N. Smith’s Night of the Crabs. Brainwashing at a posh girls’ school didn’t succeed in suppressing Anna’s horror obsession, and, alongside William Shakespeare and Jane Austen, Anna avidly studied such classic authors as James Herbert and Stephen King. Following a misguided attempt to wean herself off horror by studying Experimental Psychology at Oxford University, Anna went on to gainful employment in public relations, journalism and advertising, before throwing everything over to become a filmmaker and horror writer. Anna still lives in London, where she has given up all attempts at sensible occupations, and has devoted herself fully to writing horror stories and screenplays, and attempting to raise the money to make horror movies. 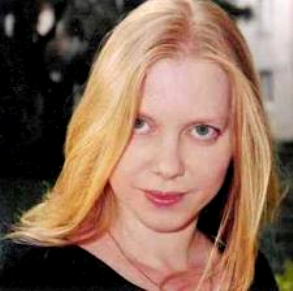 Anna's films include: The Rain Has Stopped, The Sin, Ela, My Uprising, and A Fragment of Being. Feature length screenplays include: Chainsaw, The Camp, and Pizzaman. Short stories include: Schrödinger’s Human (pending publication in the Fifth Black Book of Horror), Little Pig, Teatime, A Song for Barnaby Jones, Arthur’s Cellar, The Gatehouse, Bagpuss, Underbelly, and Buy a Goat for Christmas.